Seller: jennyholly68 (348) 97.1%, Location: leek, Ships to: GB, Item: 123292859859 Emil. 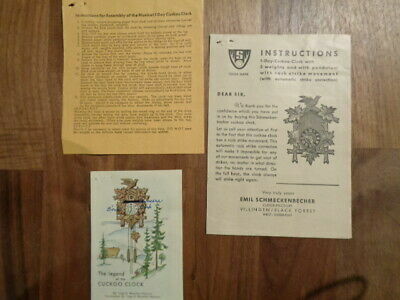 Schmeckenbecher cuckoo clock 1950s German black forest. 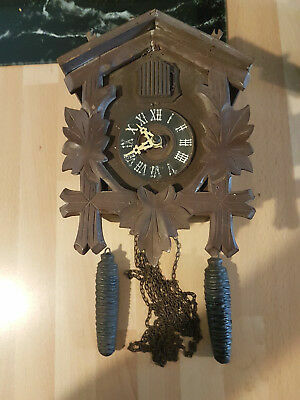 This clock has been in my mothers loft for many years, not sure how to check to see if it works so will sell spares and repairs. Popularity - High amount of bids. 0 views, 0 views per day, 262 days on eBay. 1 sold, 0 available. High amount of bids. 0 views, 0 views per day, 262 days on eBay. 1 sold, 0 available. Seller - 348+ items sold. 2.9% negative feedback. Good seller with good positive feedback and good amount of ratings. 348+ items sold. 2.9% negative feedback. Good seller with good positive feedback and good amount of ratings.